The 2018 version of the venerable six-cylinder sheds 80 pounds, picks up a claimed 20 percent improvement in fuel efficiency and sports a nifty double-wishbone front suspension that’s supposed to dramatically reduce how imperfections in the pavement are directed through the handlebars. Sounds like Honda is doing its best to have the motorcycle counteract the ravages of time and sloth, at least as they relate this rider. The Gold Wing first burst onto the marketplace in 1975 and has been Honda’s über-tourer ever since, first as a 1,000cc four and eventually as 1,800cc six. And shaft driven. Never question the shaft. The Gold Wing was made at purpose-built $50 million plant in Marysville, Ohio, starting in 1979 (that’s $181 million in today’s dollars) until production was moved to Kumamoto, Japan, in 2012. 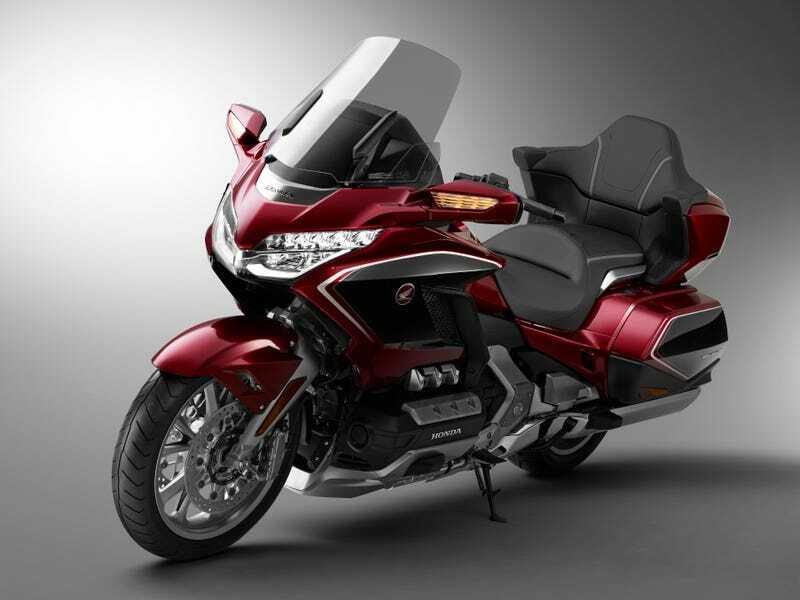 Honda is all about the newest version of the Gold Wing becoming more agile. A lot of that is from the weight savings, through even the lightest version still tips the scales at 787 pounds. It’s still an 1,832cc liquid-cooled, horizontally opposed six-cylinder engine, but Honda says it’s now nearly 14 pounds lighter, more compact and placed further forward in the chassis for better weight distribution. Yet for all of Honda’s talk about improvements in performance and maneuverability, the announcement doesn’t include any hints about horsepower or torque. Improved aerodynamics are credited with creating better fuel efficiency, allowing Honda to reduce the fuel tank capacity by 1.1 gallons while maintaining the same range as before. It kind of makes you wonder why they didn’t keep the larger tank and extend the range, though Honda says that would have upset the handling. The double wishbone suspension on the front of the bike is one of the most striking visual changes to the older version. Honda says it cuts the amount of shock transmitted from the road through the handlebars by 30 percent. The bike will come with both conventional six-speed manual transmission and Honda’s new seven-speed Dual Clutch Transmission (sort of like what they are putting on the Africa Twin: look ma, no clutch lever!). Oh yeah, and forward/reverse walking mode to help maneuver this thing through the parking lot at sub-1 mph speeds. The throttle-by-wire offers up four riding modes (tour, sport, econ and rain), adjustable torque control, hill start assist and cruise control. All of the electronics are controlled through a seven-inch color TFT display. It is also the first motorcycle to come equipped with Apple CarPlay, the mirroring system to link up your iPhone. You know car people drag on Gold Wings for having radios? Welcome to the future. The bells-and-whistles Gold Wing Tour starts at $26,700 for the manual transmission version, and $1,000 more for the Dual Clutch version. The automatic version with Honda’s airbag system comes in at $31,500. The base version comes with saddlebags but no top case or rear speakers. It has a shorter electric windscreen and does without a center stand, heated grips, electric damping adjust and torque control. And preload adjustment is by hand. The manual version starts at $23,500, while the DCT kicks off at $24,700. Both are scheduled to hit the market in February. The Gold Wing has been a Honda staple for so long, it’s easy to forget about it. And a dearth of major upgrades in recent years made it all the easier to think about other options when out shopping for a high-end touring bike. While an 800-pound bike is never truly going to be going to be sporty, Honda is injecting some of its performance expertise into the new Gold Wing, which should make it more fun to ride at the same time as other improvements make it more comfortable and efficient. Honda could hardly afford to rest on its big touring bike laurels, with Japanese rivals Yamaha jumping into the fray with the new 1,850cc Star Venture, Harley-Davidson upping its game with new engines and models and BMW with its ever present shaft-drive offerings. Seems like a good time to start planning that cross-country ride. Engine: 1,832cc liquid-cooled horizontally opposed six-cylinder. Transmission: Six-speed manual with reverse, or Seven-speed Dual Clutch Transmission with walking-mode forward and reverse. Front Suspension: Double wishbone with Showa shocks, 4.3-inch travel. Rear Suspsnsion: Pro-Link system with Showa shock, 4.1-inch travel. Front Brakes: Two radially mounted 6-piston Nissin calipers with 320mm rotors, electronically controlled combined ABS. Rear Brakes: Three-piston Nissin caliper with 316mm rotor, electronically controlled combined ABS. Tires: 130/70-18 front, 200/55-R16 rear. Curb weight: From 787 pounds for Gold Wing to 842 pounds for Gold Wing Tour Airbag DCT.